'All Sewn Up' was set up in October 2010, providing a wide range of sewing workshops teaching people how to make everything from cushions, to handbags to your own clothing. The workshops are based in a log cabin on the edge of Gower, in South Wales. 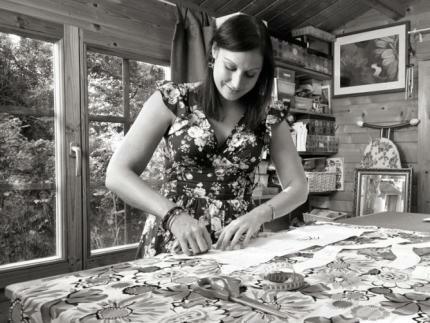 Helen provides expert tuition at the workshops which cater for up to 4 people in the studio. Monthly Fun Days are held nearby which are inexpensive ways of getting larger groups together to join in the sewing fun! Helen also designs and makes bespoke Bridal wear, so you are in good hands!